Hello babes! This year my friends and I are doing secret santa again because who has the money to buy all of their friends presents, right? Our budget is 15-20 euros so I thought it would be a fun idea to show you some great things under €20 to put on your wishlist! 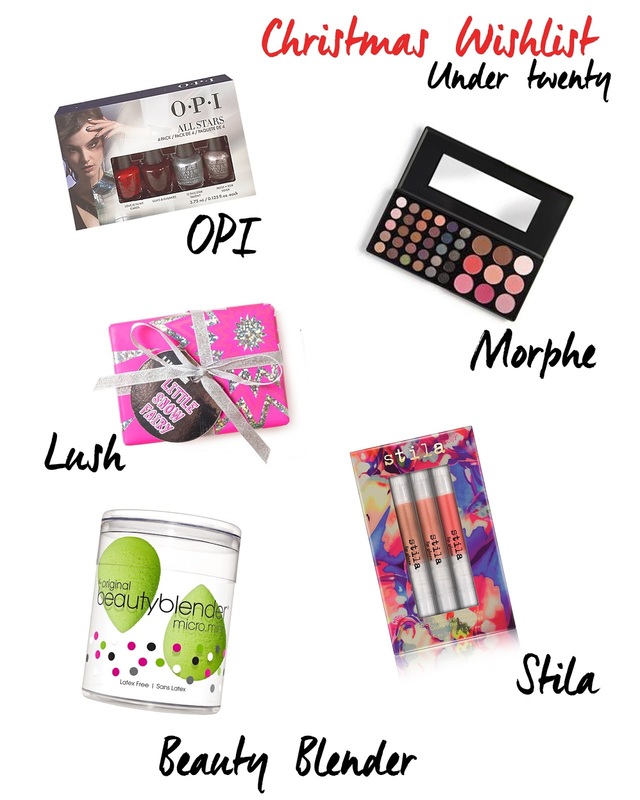 These are mostly things that I haven't tried before because they are also on my own wishlist ;) Hope you get some ideas! OPI can be very expensive, that's why I love these mini collections! I love these colours, especially for christmas. Lush always has amazing gift boxes, this box contains a candyfloss scented shower gel and a pink FUN which is great for a relaxing bath. I already have the regular beauty blender and these would be awesome for applying concealer! This cute Morphe palette has 39 eye and cheek colours! It's very compact so it's great if you want extra colours while travelling. I've never tried these lip glazes but I love Stila so I'd love to try these!